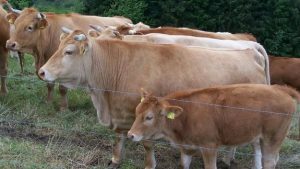 Glan Cattle, a dual-purpose breed now nearly extinct, are very unusual both in the kindness of their temperament and their coloration and production rates! Glan Cattle are gentle and extremely easy to handle. They make good producers for smaller farmers because of their quiet, docile, sweet nature. Glan Cattle adapt very well to most stationary management systems and make good grazers. At maturity, Glan bulls stand 148 centimeters at the shoulder and cows are about 140 centimeters. Bulls weigh 950 kilograms and cows average about 650 kilograms. Glan Cattle are usually yellow in color! They range from a pale honey color to a dark reddish brown. The yellow shades are vastly preferred. The face, underside, and lower legs are generally a lighter color than the rest of the Glan cow’s body. The muzzle is generally extremely light, as are the horns and hooves. The broad forehead is topped by horns that curve slightly downward, and the muzzle is squared and short! Glan Cattle have long, broad bodies with level backs and well sprung ribs. They tend to be hardy and very long-lived! Generally, Glan Cattle average 4,500 kilograms of milk per year! Three and a half percent of that is protein with four percent fat, making the milk ideal for cheese production! When used for beef, Glan Cattle usually show a carcass yield of about 60 percent. The meat is of extremely high quality and very red in color. Originating in Germany, Glan Cattle are now nearly extinct. The herd book was established in 1898, although Glan Cattle originated about 100 years earlier as a native cattle and Swiss Brown cross. They were used as milk, meat and draft animals. In 1960, Danish Red Cattle were crossed into Glan lines. Today, although once extremely prolific, Glan Cattle numbers are fading. In 1985, a preservation society was established, and Glan Cattle have made a slow comeback, which remains precarious. Glan Cattle who show phenotypes similar to Danish Red Cattle are highly undesirable in show and breeding programs. Generally, Glan Cattle perform best when housed for the coldest six months of the year and offered mixed feed. They are well adapted to poor soil and grazing conditions and to cold or harsh climates. Glan Cattle, because of their dwindling numbers, must be bred responsibly. Because they were such valued cross breeders, their endangerment was once effected! Glan Cattle show average rates of calf mortality and calving intervals, along with calving ease and age at sexual maturity. They are good milkers and may be used as suckler cattle. Birth weights of Glan Cattle tend to be low, though they show an average daily gain of 1,200 grams! These cattle are generally extremely fertile.